TERROR BEER? 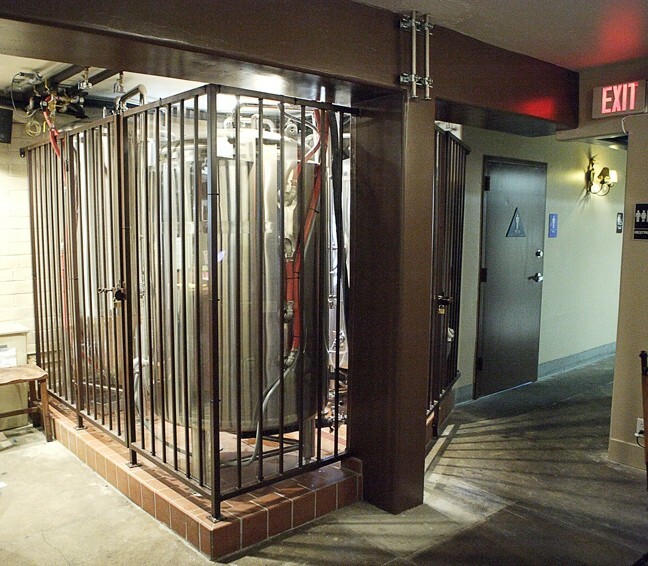 : Creekside Brewery tanks were encased with thick plastic and metal bars not as a design choice, but to thwart terrorist attacks. Two SLO brewers were eager to open their new pub, but first they were told they had to protect the beer from terrorists. As far as they can tell, they may be the only guys in the country who have been forced to fortify their brewing tanks, and no one can give a clear answer why. John Moule and Eric Beaton are co-owners of the newly opened Creekside Brewery in SLO. The brewery has been open for little more than a month, but it could have opened sooner. Aspiring beer makers have to slog through a lot of paperwork before they can start serving the public. Breweries like Creekside need dual approval: first from the federal Tobacco, Tax, and Trade Bureau (TTB); then from the California Department of Alcoholic Beverage Control. Brewers can’t get state approval to sell alcohol until they get a federal OK to brew beer. The TTB forced Moule and Beaton to better protect their product. That much is clear. Exactly why they had to do that isn’t quite so obvious. The TTB application required Moule to check a box stating that the brewing equipment was secure, but there was no definition of what secure meant. Moule thought the tanks were fine, so he checked the box. He was wrong. Originally the tanks at Creekside were partitioned by a couple of poles and chains. A TTB representative told the owners the tanks had to be behind a physical barrier with locking doors. Moule and Beaton protested the last-minute and costly requirement, but didn’t get very far. Aside from the added cost, a wall would hide the tanks and destroy the brewpub atmosphere. Even after Moule put locks on all the openings, TTB representatives still said it wasn’t enough: they had to put up a wall. It took some prodding, but Moule said the representative finally told him the wall was needed to prevent someone from poisoning the beer. What’s more, she told him it was a post-Sept. 11 measure that fell under the supervision of the Department of Homeland Security. New Times tried to track down precisely which anti-terrorism precautions required that the tanks be behind walls, with no luck. Now the two sets of tanks look more like museum antiquities. The tanks upstairs are surrounded by thick glass. The tanks downstairs sit behind thick plastic and even iron gates. Those extra security measures cost about $15,000. The message to Moule and Beaton was clear; both recalled they had been told to build a wall. Federal agency members, however, could not confirm or deny any requirement for breweries to wall out terrorists. Representatives were confused by the situation and quick to point a finger at other agencies. Some breweries already segregate the tanks from the public, particularly those with the room to do so, Moule said. But Moule and Beaton easily listed off other breweries where the tanks are fully exposed. Paul Gatza of the national Brewers Association said the Creekside case is the only one he is aware of nationwide where the tanks had been forcibly terrorist-proofed. “It crossed my radar because it was so unusual,” he said. Their case is so unique, in fact, that even federal officials couldn’t agree on where the brewery regulations come from, or who enforces them. Amy Kudwa, a Homeland Security spokeswoman, said the department does not handle regulations on alcohol or breweries. She deferred questions to the Bureau of Alcohol, Tobacco, Firearms, and Explosives; and the U.S. Food and Drug Administration. The ATF has not regulated alcohol for about five years; that job is now left to the TTB. FDA spokesman Michael Herndon said the administration does not regulate alcohol. But Art Resnick of the TTB believed the security rules for breweries were derived from the Bioterrorism Act of 2002, which he believed to be enforced by the Food and Drug Administration under Homeland Security. Tom Hogue, also with the TTB, said brewery construction guidelines are actually dictated by the Internal Revenue Service code. “The Internal Revenue code requires that brewery buildings be constructed in a matter that adequately protects the revenue and prevents unauthorized access,” he said. The code does say that, but it doesn’t say what qualifies as protection. It gets even more puzzling. Herndon said the Bioterrorism Act does not reference breweries. When asked again, Kudwa re-emphasized that Homeland Security does not deal with alcohol regulations. The Bioterrorism Act, while it is intended to protect food from being spiked with poisons, does not require physical security barriers. Generally the act is intended to impose extensive record keeping on the food industry. One local FDA representative said the agency provides suggestions to the food industry about how to protect their product, but not hard enforcement demands. The only thing all of the agency officials seemed certain of is that anti-terrorism walls aren’t part of the Bioterrorism Act. One possible explanation for the whole terrorism/brewery link could be that TTB was spun off from the Department of Alcohol, Tobacco, Firearms, and Explosives as part of the Homeland Security Act of 2002. So what’s the real terrorist threat at microbreweries? According to Moule and Beaton, anyone hell-bent on poisoning their beer would first have to climb the 10-foot tall tanks in full public view. Next they’d have to unscrew a wing nut, unlatch the tank, and open the cover. If they go after the serving tanks, they’ll also get blasted in the face because the tanks are under pressure. Staff writer Colin Rigley may have to enlist if terrorists attack his beer. You can reach him at crigley@newtimesslo.com.